Isn’t enhancing performance a good thing? These PEDs are so potent that they need to be outlawed in sports as to level the competitive playing field. They clearly create such an unfair advantage. So why aren’t we testing the medicine in these drugs and providing them to our military? Or people with debilitating illnesses? There are so many good societal uses for PEDs beyond baseball. Look what it did for the cast of 300. If everyone was on HGH, we’d probably walk or bike more and drive less. Maybe we’d save the planet. It’s really all part of the evolutionary process. If not for advances in drugs and medicine, all our ancestors would have succumbed to plague and we wouldn’t be here to debate this issue. The reality is the human race constantly grows and evolves. We are bigger, stronger, faster, and have a longer life expectancy than we had the generation before, and the generation before that, etc. Think about the pressure to use. Money. Success. Your teammates. Don’t you want to enhance your performance? To help your career? Your family? Your team? If you don’t take the PEDs, you still have your ethics. At least you got that going for you. Maybe the history books will recall how clean you were in your non-distinguished career. And what measuring stick do we have to judge these guys? Barry Bonds: Mountain of evidence. Roger Clemens: Cover boy of Mitchell Report. A-Rod: Positive anonymous test. Outed by ruthless reporter. Manny Ramirez: Positive test for banned substance. Miguel Tejada: Lied to Congress. Sammy Sosa: No positive test. No admission of guilt. Does anyone actually believe he’s clean? Does he go straight to Cooperstown? The whole era is tainted. If the red flags didn’t go up during the great McGwire/Sosa Home Run chase of 1998, they sure did when we saw Bobby Estalella. So where do we go from here? 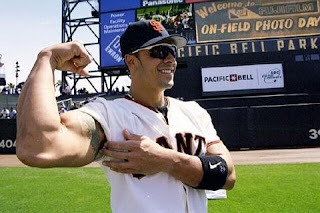 I think the only fair thing to do is to remove the ban on steroids, HGH, and all PEDs. Naturally, there has to be a comprehensive, mandatory education program that begins in High Schools, so that every athlete, every person, knows about the pros and cons of these substances. When you turn 18, you need to be able to make your own informed decisions about your own body. Since the juicing would be above board, Major League Baseball (and all other sports) should still implement much more comprehensive testing. This way, teams know what players are taking what, and they can weigh the health risks before signing these guys to multi-year, multi-million dollar contracts. And maybe we’ll settle into an era where PEDs become mainstream across baseball, America, and the globe, and they are regulated and safe.